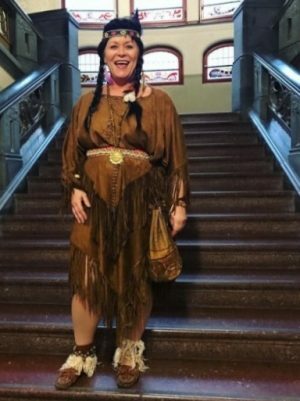 Finance Minister Siv Jensen set off quite a fuss over her decision to attend an autumn party at the finance ministry last weekend, dressed as Pocahontas. The photo she posted of herself on social media set off a torrent of criticism that surprised her, while others rushed to her defense. “This is shameful and incredibly disrespectful,” railed one of the hundreds of comments posted under the photo of Jensen posing on the stairs inside the ministry. It shows her wearing a dress adorned with fringes, and a wig with black pigtails and headdress. Kenzie Allen, a doctoral student at the University of Wisconsin in the US who has ties to both Norway and the Oneida people, commented that people using such a costume may not understand the culture of indigenous people or the oppression they’ve experienced. Indigenous people often are reduced to caricatures, she noted, but criticism of the practice is rising. Some major department stores, stocked with costumes in the run-up to Halloween, have removed so-called “Indian costumes” from their shelves. Opposition politicians Hadia Tajik of the Labour Party commented wryly that she thought Jensen was “a fine Pocahontas,” and was more critical of her politics. TV celebrity Davy Wathne wondered whether it would be considered blasphemous to attend a costume party dressed as Jesus.